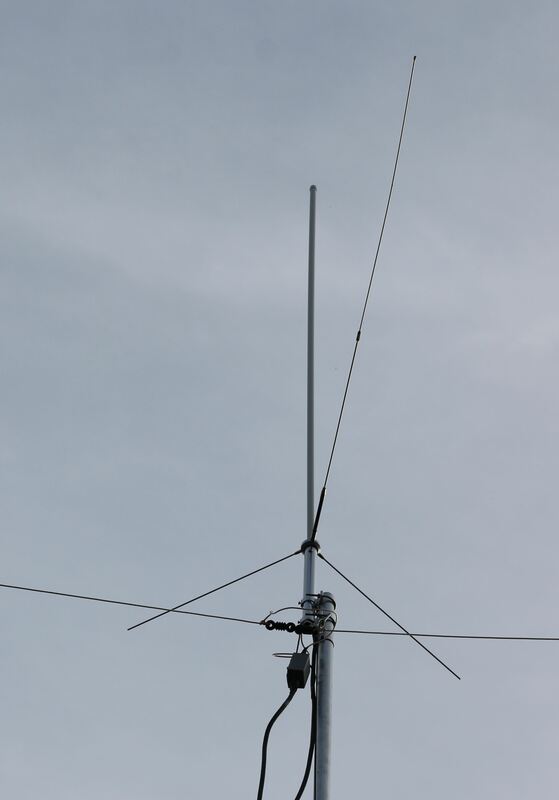 Much as I enjoy the hexbeam (and I still get a kick out of watching the SCAM12 mast go up-and-down) I have been looking for something suitable for the lower bands (40m/80m). Not wanting to antagonize my neighbours any more than absolutely necessary. I have been thinking about a vertical, something that can be partially masked by the trees at the end of my 35m garden. This should also remove the antenna far enough from houses so that RFI isn't a problem. My first attempt was a 10m telescopic fibreglass pole with internal wire and a single ground wire. This wasn't particularly useful on any bands as the SWR was pretty high. My tuner was able to match it on most frequencies (even topband occasionally) but with 40m of Westflex WF103 coax, I guess that quite a bit of power was being lost. After quite a bit of research, I was starting to look at the "proper" verticals made by companies like Cushcraft and GAP (not to be confused with the popular clothing retailer). Luckilly for me, during my research, Neil (2E0MNG) had advertised his GAP Titan DX forsale on a local Facebook group. It was partially disassembled but complete. After a brief exchange to work out whether it would fit in my car, we struck a deal and I drove over to Neal's QTH to collect it. He had done a very good job of taking it down, labelling all parts so reassembly was a breeze and I had it assembled and "up" in about 3 hours! As you can see, it is mounted within the trees at the end of my garden. I am not sure how much the trees will interract with it but so far, the SWR figures that I have received have been very positive (detailled below). It is mounted on a 3m Aluminium scaffold pole which is attached to the fence at the end of the garden. I know that I should probably improve the fitting, GAP Antennas recommend digging a 1m deep hole and burying a plastic sleeve before filling the hole with concrete (this allows removal of the antenna) but I have seen very little movement and I haven't actually done anything with the 3 guy ropes that Neal provided (they are attached though). Manoeuvring the antenna around tree branches and fitting the counterpoise was quite a challenge but I was able to get the antenna mounted fairly easily. Once I had the antenna up, after a slight mishap with the PL-259 plug that I had attached to the end of the feeder coax (it got caught on my ladder and I obviously hadn't fitted it very well!) I got another PL-259 attached and connected my trusty RigExpert AA-30 antenna analyzer. Having done NO TUNING at all of the antenna, I was quite surprised how well it seemed to be setup out-of-the-box, with the exception of 30m which seems to have been missed, it is pretty-much spot-on! This is perfectly usable across the DATA region and most of the SSB region of the 80M band (the bits I am interested in) but is unusable right at the top of the band so I will need to make sure that I stay away from 3.72Mhz-3.80Mhz! 40M provides a very nice VSWR curve with the entire band being 1.5:1 or under. Of the two, this the band that interests me the most as it is pretty-much always open so I am very happy with this. Although I am less interested in the performance on the other bands (as I have the Hexbeam for all of those except 30M) Here are the results for the sake of completeness! 30M is the worst of all the bands but as it is limited to CW or DATA only, I rarely venture here so not a major problem for me at the moment. I can probably tune it if I really feel the need though. Time will tell how this performs I suppose but I am happy so far so heres to plenty of 40m/80m DX! Here are some other pictures that I took before it got too dark! You can just see the GAP Titan DX behind the SCAM12/Hexbeam but it really does seem to disappear into the background!